With the year closing today I look back over the year at my collecting goals and see how I faired to what I had set for myself back in January. The goals that I set were attainable and within reason I was able to complete most of them. Around mid-year things in the real world took a turn for the worse and I found myself in collecting funk, which I am still dealing with. This did put a dampener on my 5-Year Blogversary plans but I will work on that in the coming year. Done- I didn’t make as many trades as I hoped to but I did add a Trade Bait section as well as joined Zistle and this has led to a handful of trades over the year. I did add another goal during the year. When I joined Zistle in January and organized my collection I realized I only had 92 unique Griffey cards and that didn’t seem appropriate for someone who is a Griffey collector. This was when I started building my Want List and set an additional goal of 200 unique Griffey cards by the end of the year. I hit Griffey card #200 on July 29th and have since increased my collection to include 291 unique Griffey cards. The final card of the year to be added to my collection is this 2014 Topps UFC Bloodlines Ryan Bader #1/1 blank back from Topps Vault. Bader is my favorite MMA fighter and a heck of a good guy. 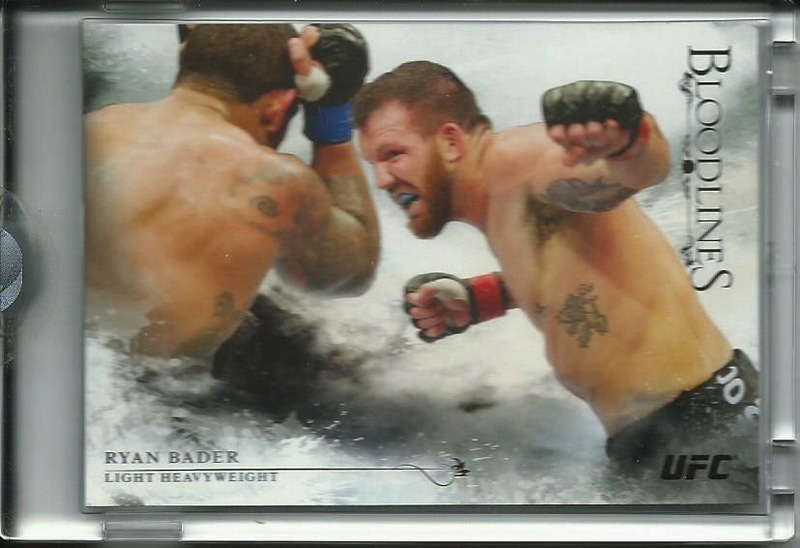 I recently missed out on another Bader blank back Topps Vault card being sold by Topps a couple of weeks back and had accepted the idea that it would be a awhile before I added a Ryan Bader #1/1 to my collection but I ended my year on a high note. I have never considered myself a toy collector, though I do still enjoy adding a well-designed action figure to my collection. I worked as a retail manager for a little over a decade and I met my fair share of various collectors. Some peeked my interest and from time to time I would grab a neat Johnny Lightning car or Starting Lineup figure but I tried to disconnect myself from that mentality because it is so easy to get caught up in the excitement of something new or limited. After multiple moves I decided to clear out portions of my collection and I started to sell off or trade anything worth its weight in plastic and when my kids got old enough I let them rip open most of what remained. I opened the Griffey figures and have them displayed on my shelves too. While I do have a couple of figures still sealed, only because I don’t know if I want to sell them or display them, I tear open everything else. 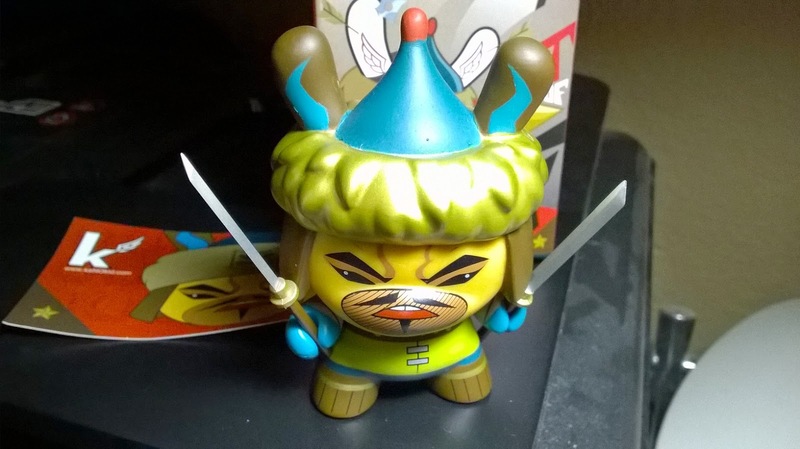 The other day I gave in and ordered a Kidrobot Genghis Khan because of how cool it looks. It cost me $4.25 shipped but as soon as I got it home I tore it open and old Khan is chilling on my television with swords ready for battle. 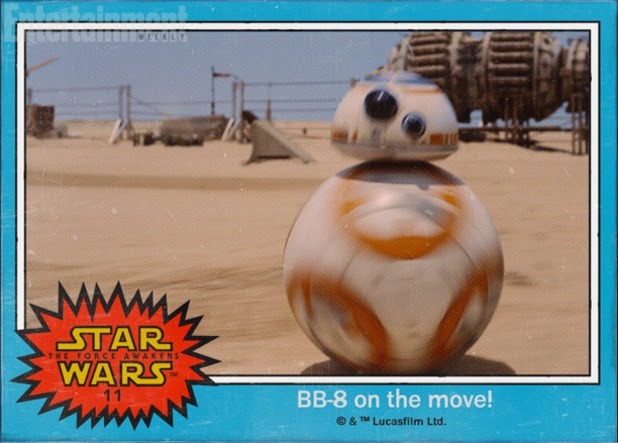 Does J.J. Abrams know fans of Star Wars or what? 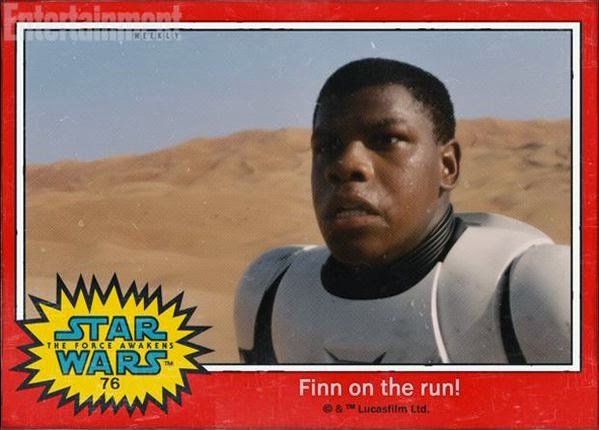 Shortly after the trailer for Star Wars: Episode VIII- The Force Awakens was released the day after Thanksgiving Abrams went one step further to make fanboys drool when he released images from the trailer used to introduce some of the new characters from the movie. 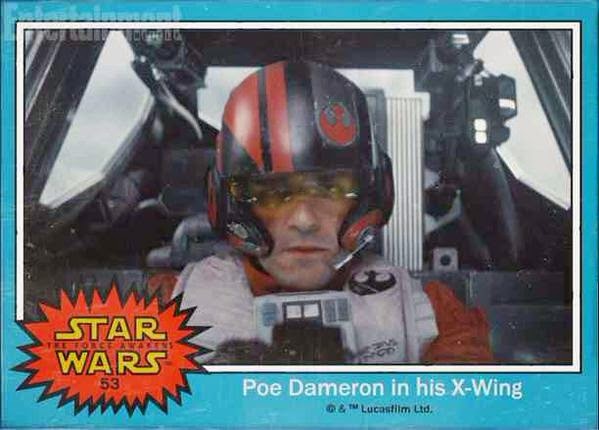 What better way to get fans excited about the closing trilogy than to go back to where it all started and use the original 1977 Topps Series 1 (Blue border) and Series 2 (Red border) design to introduce the world to Poe Dameron, Finn, Rey, BB-8 and Kylo Ren. 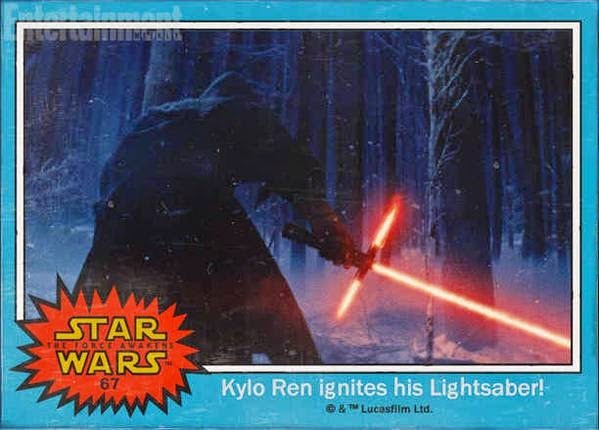 The cards were posted through Entertainment Weekly's website and have since lit up Twitter. 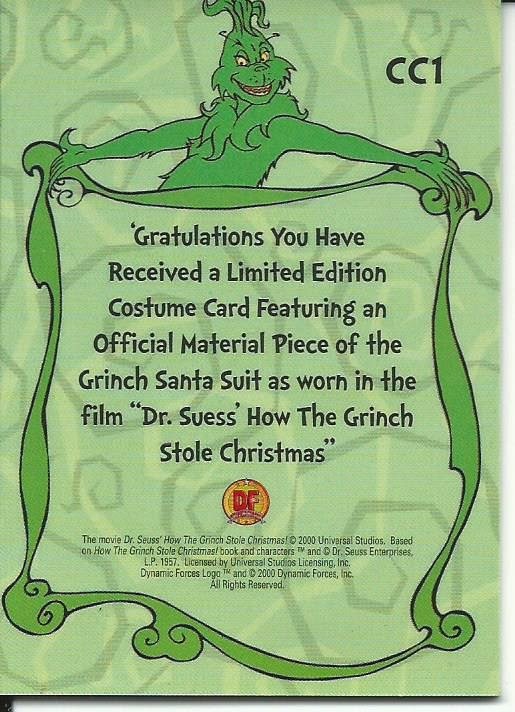 I have been chasing the Grinch costume cards and finally added this beauty to my collection #CC1. The set is the 2000 Dynamic Forces How The Grinch Stole Christmas and is made up of 99-card checklist, puzzle insert sets, a motion insert set, Then & Now insert set and Extreme Grinch insert. 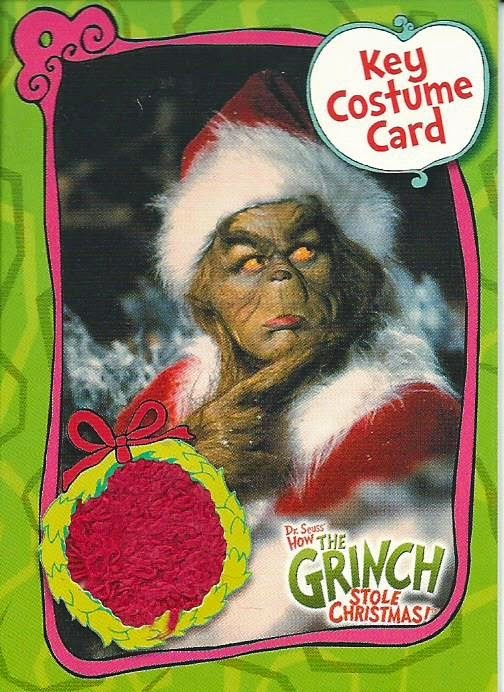 There were four hit inserts; an 11-card Animator Autograph set, a four-card autograph set #/50 (2 Tambor & 2 Baranaski) two Key Costume Card Grinch relic cards (#CC1 & CC2) and two 5x7 Case Topper Grinch relic cards (CC3 & CC3). Have you ever wanted to live the life of a professional baseball player? Who wouldn’t want to get paid to play a sport they love? Well now you can get paid and you don’t even need to be able to play, though it will require you to have at least $550,000 available. Yesterday the IRS announced that they will be auctioning the remaining annuity from the deferred portion of Darryl Strawberry’s 1990 salary. His 1990 salary with the Mets contained a $1.8 million team option but it was broken up and $700,000 was deferred, being put in to an annuity with a 5.1% APR. 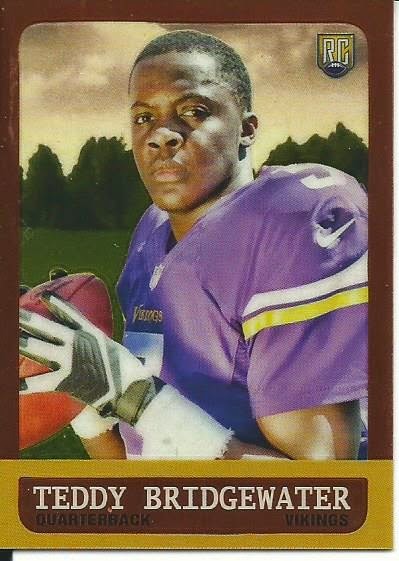 Over the years the investment went to his ex-wife in a divorce settlement but she lost it to the IRS when she filed bankruptcy because the couple still owed $542,572 in back taxes from Darryl's playing days. Since then payments owed by Strawberry to the IRS have been missed and the big wigs decided to close the case and collect their back payments through selling off the annuity. The auction begins January 20, 2015 with an opening bid of $550,000 (the amount owed plus auction fees). The current value of the deferred contract is $1.28 million and will be paid by Sterling Mets LP, the NY Mets parent company, following the closing of the auction on May 1, 2015. The payments will be made over the next 18 years as 223 monthly installments of $5,739.91 each. Along with my Ken Griffey Jr. collection I have a nice Seattle Mariners collection, while not as big as my Griffey collection it is still a nice little addition. Jay Buhner is my second favorite Mariner after Griffey but I am also catching up with some of the young guys that the team is being built around now. Dustin Ackley and Mike Zunino are my main focus of the modern team and I am working on picking up a trifecta of each. 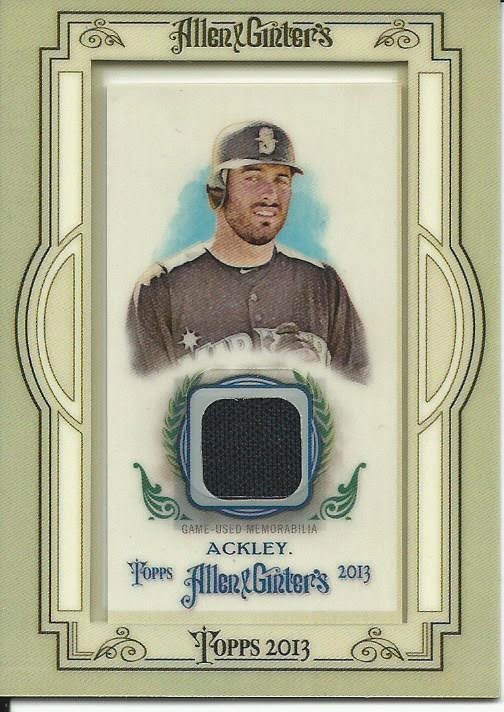 I finally completed an Ackley trifecta, but I am still working on the Zunino one though. 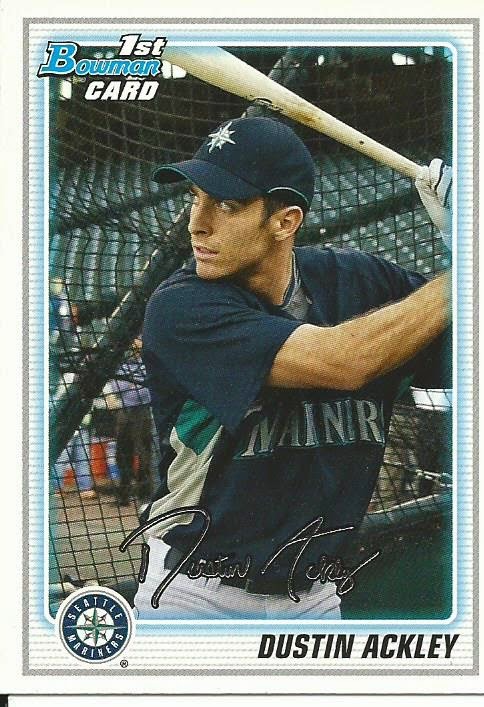 Dustin Ackley was drafted by the Mariners in the 2009 MLB Draft out of the University of North Carolina as the #2 pick behind Strasburg. He made his debut for the Mariners following a June 2011 call up at Second Base but has since moved to Left Field following the Cano trade in 2013. 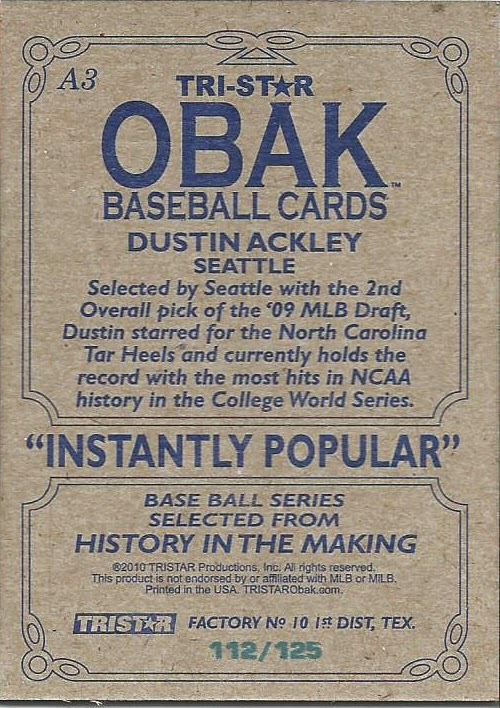 I recently added a nice Ackley autograph to my collection, a 2010 TriStar Obak autograph #/125. 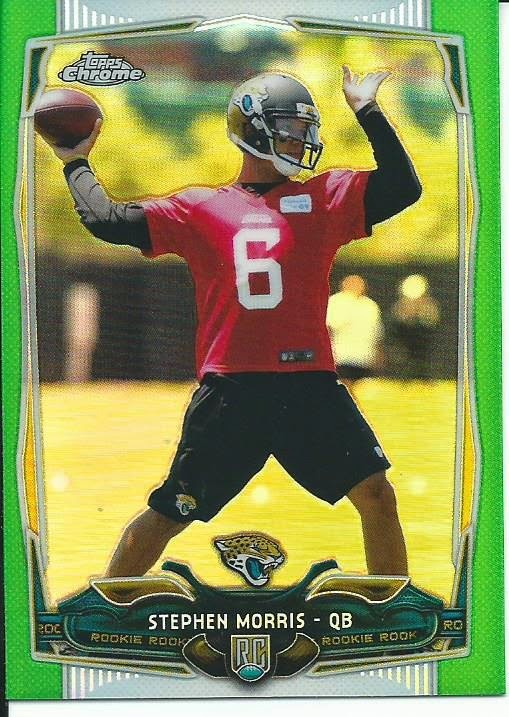 I actually didn’t even realize it was numbered until I had scanned it in. 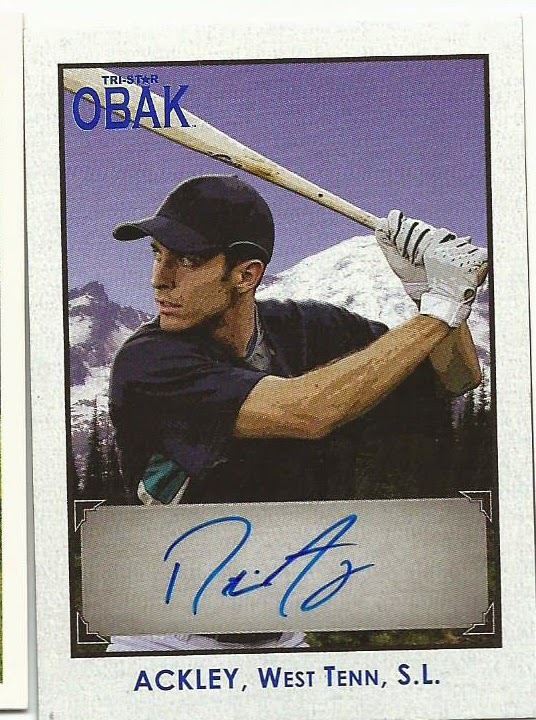 A bit odd that TriStar used the same exact image on his Obak card that Topps used on his Bowman card, pretty lazy TriStar. I am pretty excited about this, but I think at this time making a quintfecta (RC, auto, jersey relic, patch and printing plate) is going to be pretty difficult. Ackley is a solid player but he is surrounded by popular players like King Felix and Robinson Cano along with a strong young group of prospects like Mike Zunino, Austin Jackson and Taijuan Walker so he ends up getting buried in the Mariners popularity contest. 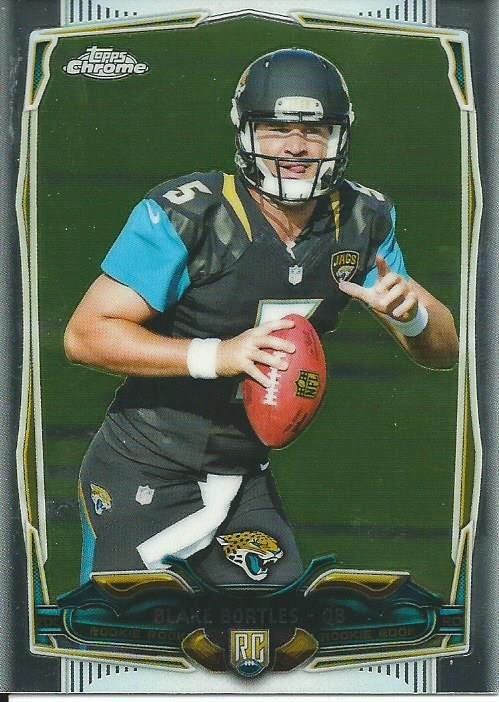 This gets him on to the base checklist of sets but when it comes to the upper end products that include patches and printing plates he doesn’t make the cut as often so options for these hits are more difficult to find at a reasonable price. After selling off the four 2013-14 Panini Immaculate Basketball that I didn’t need in my collection I turned towards picking up some wanted Griffey cards and one specific “other” card that has been on my personal want list for a couple of years. The “other” card finally arrived today. As a teen and young adult I surfed, as difficult as that was living in Arizona. I was fortunate enough to be able to spend time with friends in California regularly hitting Redondo, Hermosa and Manhattan Beaches with the occasional outing to Zuma Beach. Being out on the water is just something Zen, completely at peace. I grew up reading about guys like Bob McTavish and Duke Kahanamoku and idolizing surfers like Derek & Michael Ho, Gerry Lopez, Tom Curran and Laird Hamilton but the guy who I really liked is Kelly Slater. He is the same age as I am and he began ripping it up in the late 1980s and hasn’t slowed down since. 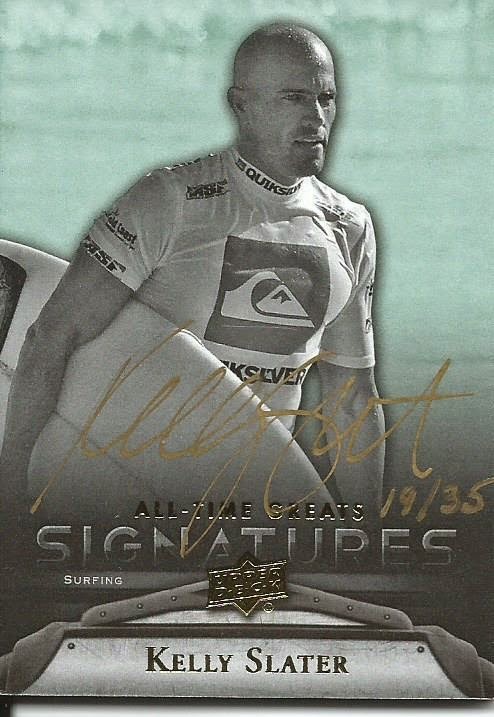 He is an 11 time ASP World Championship Tour champion and currently has 54 total WCT victories, the most all-time. 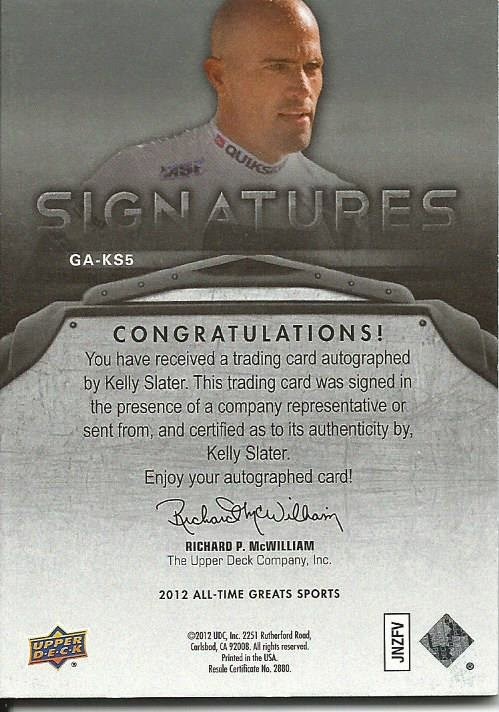 From the 2012 Upper Deck All-Time Greats release I am happy to finally add a Kelly Slater autograph to my collection. I love the gold signature, it looks great on the card. I still want to add his Shining Moments auto (#SM-KS3) to my collection but that one will have to wait because prices are still well above my price range. On December 17, 1989 FOX unleashed The Simpsons in their own 30 minute show when they showed “Simpsons Roasting on an Open Fire. The episode, which was initially scheduled as the #8 episode, was shown first because the show’s season was delayed so starting with a Christmas episode was the next best thing. Since the episode hit the air it has become the longest running primetime series with 561 episodes not to mention a movie, comic books, action figures, books, CDs and multiple card sets. As much as I have loved the Simpsons since day 1 I have only opened one box (in 1994) and a handful of packs. 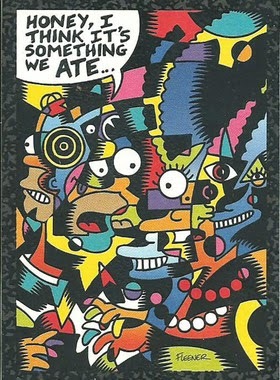 I was fortunate enough to pull a Mary Fleener Arty Art card from the box, which remains in my collection to this day. Since then I have slowly added to my Simpsons collection with two big pick ups just a couple of months ago. 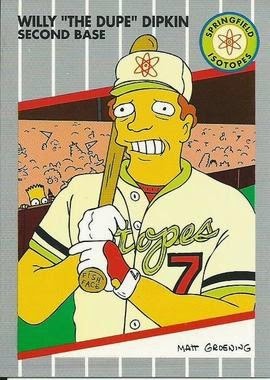 In June I came across a very fair price for the entire 6-card neon set from the 2000 Inkworks Simpson’s 10th Anniversary release and then in August I grabbed up a 1994 Simpsons Series II Willy Dipkin B1 promo card. 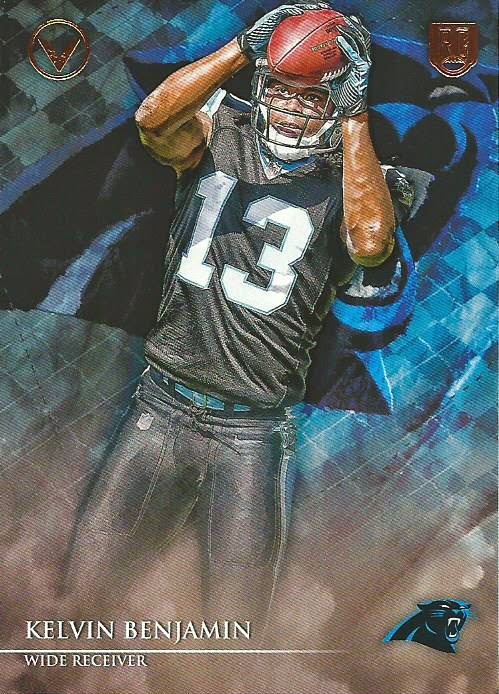 I still have my sights on a 1994 Skybox Willy Dipkin P4 promo card (the one with stats on the back), the 1994 Skybox Shadowbart Arty Art (#A4) card, 2000 Artbox Homey Isle Style promo and any of the autographs from the 2000 Inkworks Anniversary release or the 2001 Inkworks Mania1 release. This was one of those late night purchases that was purely fueled by nostalgia. These old movie sets were mass produced to coincide with a major blockbuster release and because they were often last minute addition money grabs the cards were usually just a fuzzy screen grab tossed on to poorly designed junk wax era cardboard with a corny (or basic) description with the back including a short write up about the character or scene. 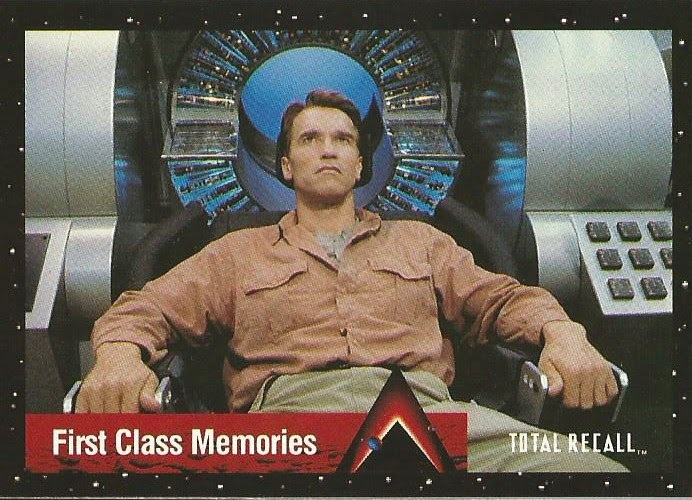 When Total Recall came out in June 1990 I was stoked, it was freaken Arnold Schwarzenegger going to Mars. The movie came out a week after I graduated high school and I took my girlfriend to see it a couple of times while it was in theaters and bought a copy when it came out on VHS later. Easily one of my favorite movies of the era. 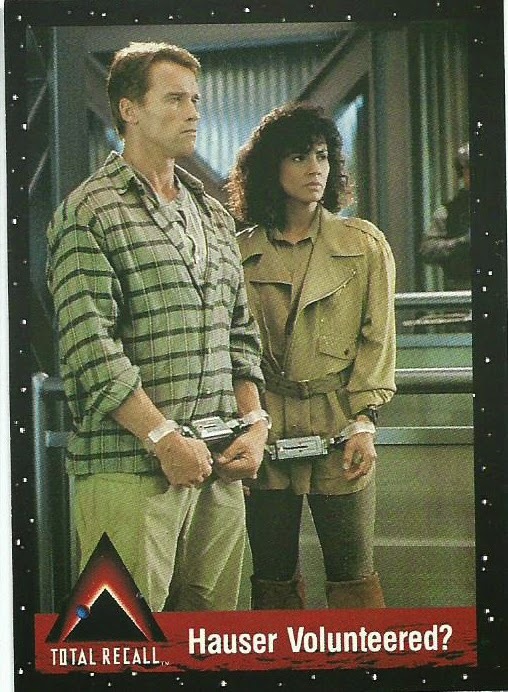 While I love the movie I never had any interest in the card set until I came across an Amazon ad which peeked my interest. It isn’t the cards that grabbed me but the swag that came with it. 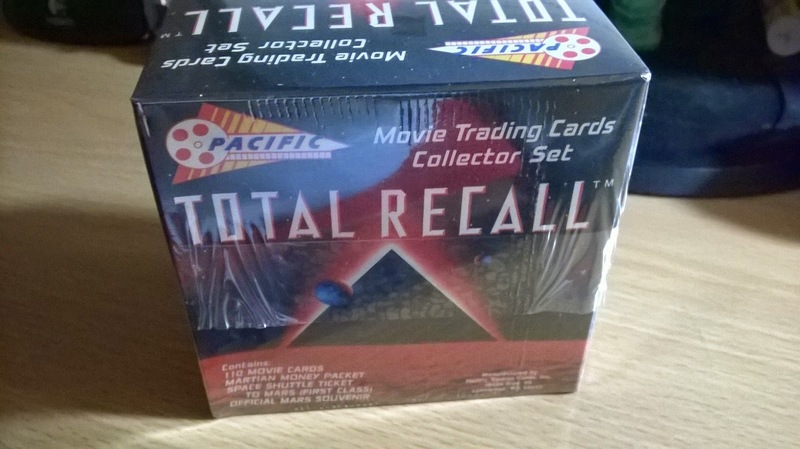 Each box contained a card set plus some movie related “collectibles” but you will have to wait until the end of the break to see what made me drop $7.50 on a junk wax era movie set. When I got the box yesterday it is still wrapped in 1990 wrap that actually has become so brittle that it stuck to the box and tore off in pieces, the sign of a quality product. 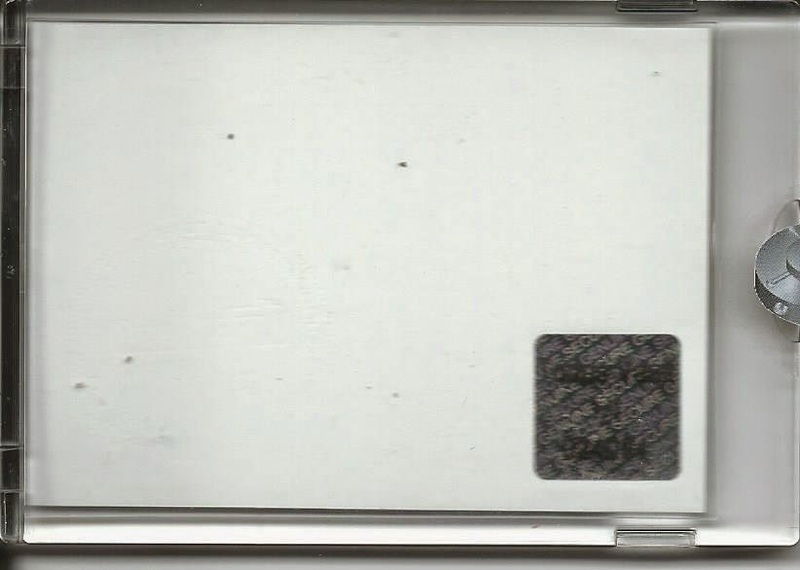 What is that on the right side? You will have to wait… or just scroll down, either way works. 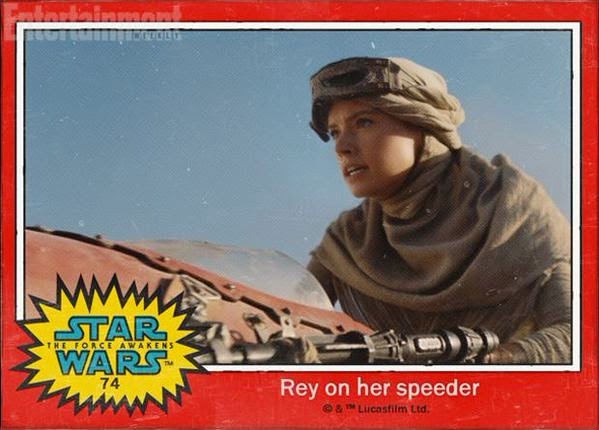 The set is exactly what you would expect from the time, weak cardboard showing it’s age with fuzzy pictures on a generic star-like background and the movie logo. 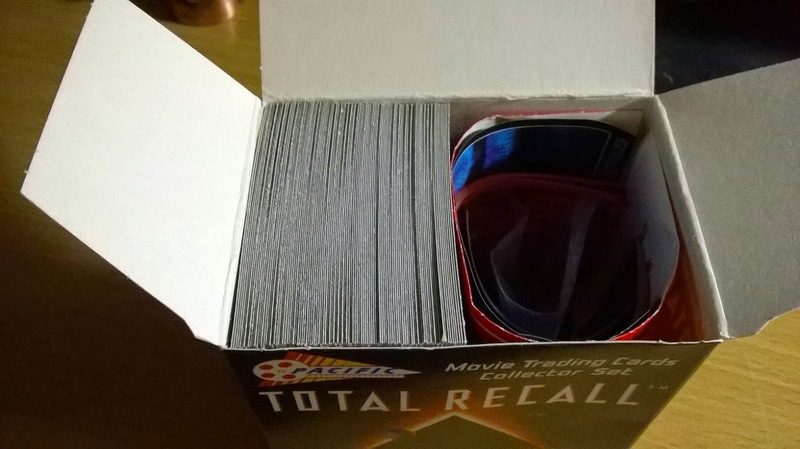 You get an entire 110-card set in each box and the set goes in chronological order with card #1 being the title card and each card after being a continuation of the storyline. The back of the cards include the scene description along with some quotes. Here is a selection of the cards from the set. 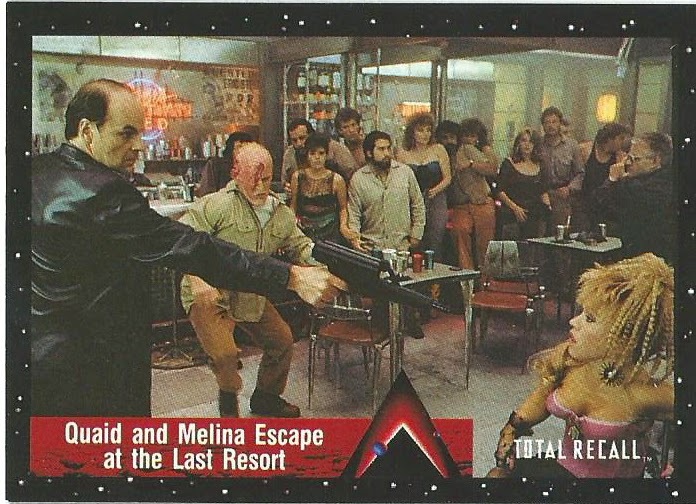 Arnie and his posse escape Richter by going in to the Last Resort Bar/Brothel. The bad guys get in and a shootout occurs. Uh oh… we find out Arnie is a double agent with a wiped out memory, he is a bad guy. Don’t worry, he does the right thing in the end. 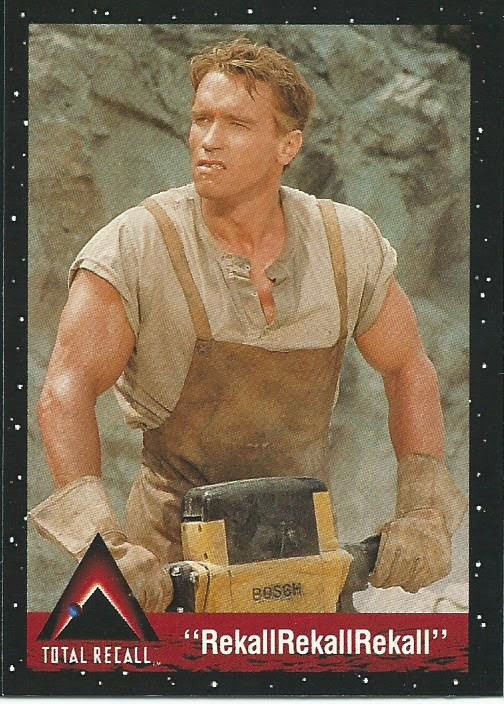 The beginning of the end here when Arnie does good and turns on a machine built by ancient Martians to produce oxygen to be released in to the atmosphere. 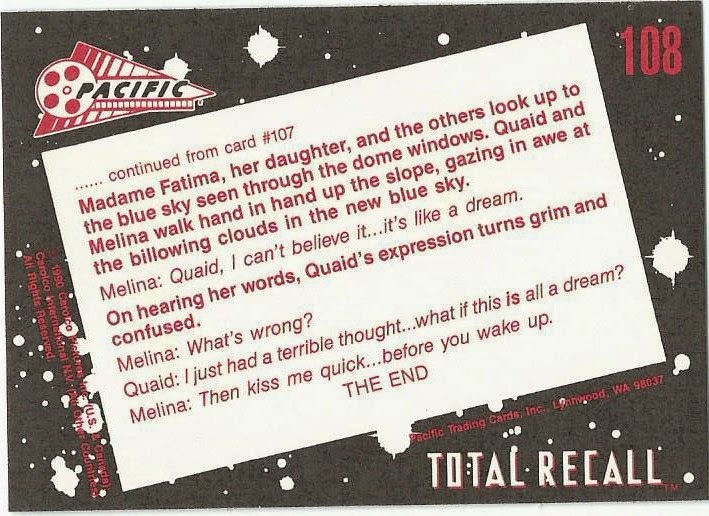 Here is the back of the final card of the storyline, as you can see it is continued from a previous card and the final words from the movie. 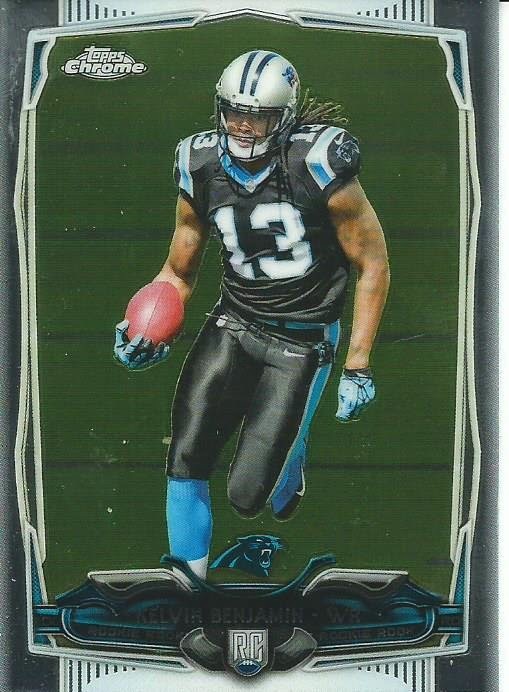 Cards #109 and 110 contain scenes from commercials/ads for the movie. 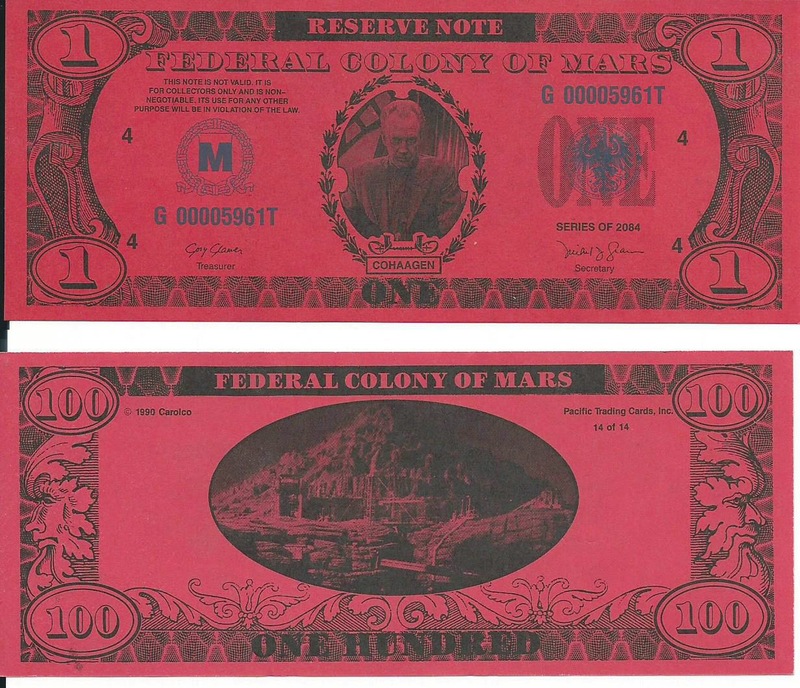 1199 credits for a virtual trip to Mars? Wow, that seems like a lot but at least I have the receipt to show I did it (if I am still alive in April 2084). I wonder if I can get a refund on this? Sadly each bill looks exactly the same with only the numbers/denomination and serial number being different. 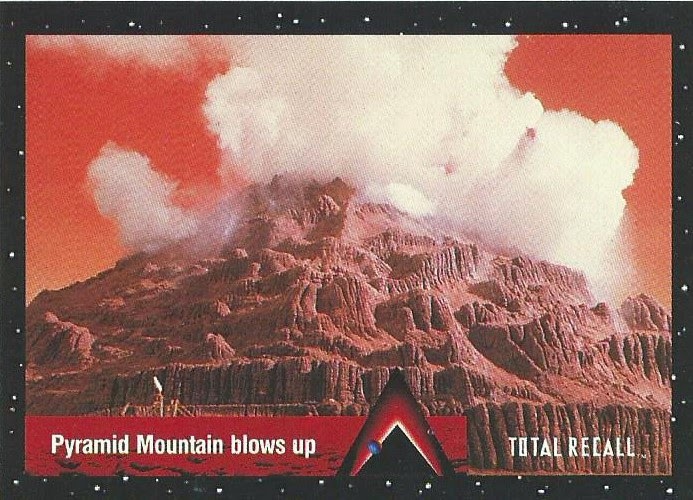 They all include Cohaagen on the front and Mount Pyramid on the back. 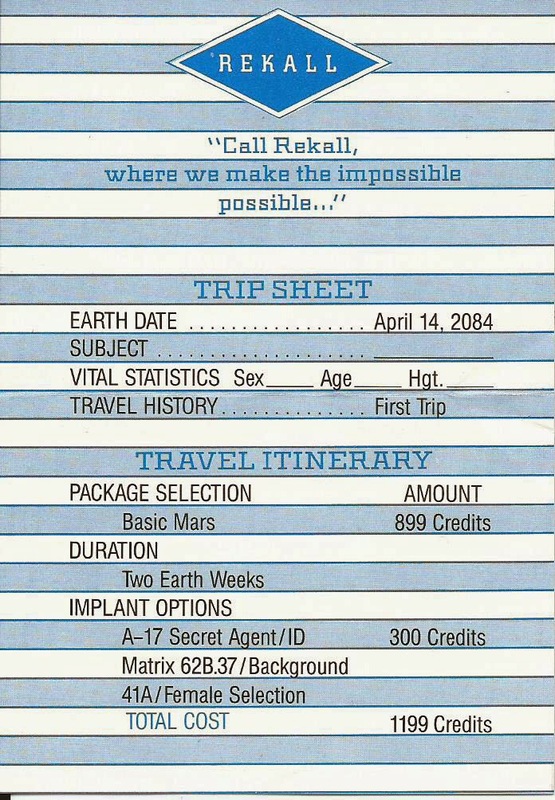 That’s right, I have my First Class ticket to Mars already booked, again if I live to 2084, which includes a private cabin at the Mars Hilton when I get there. 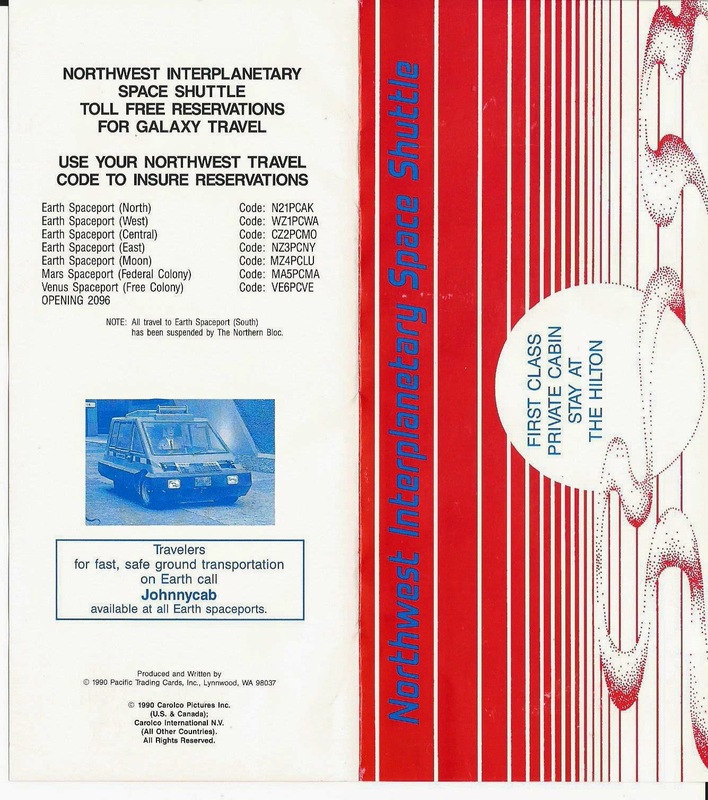 Odd how this also cost 1199 credits, the same as the Rekall virtual trip. 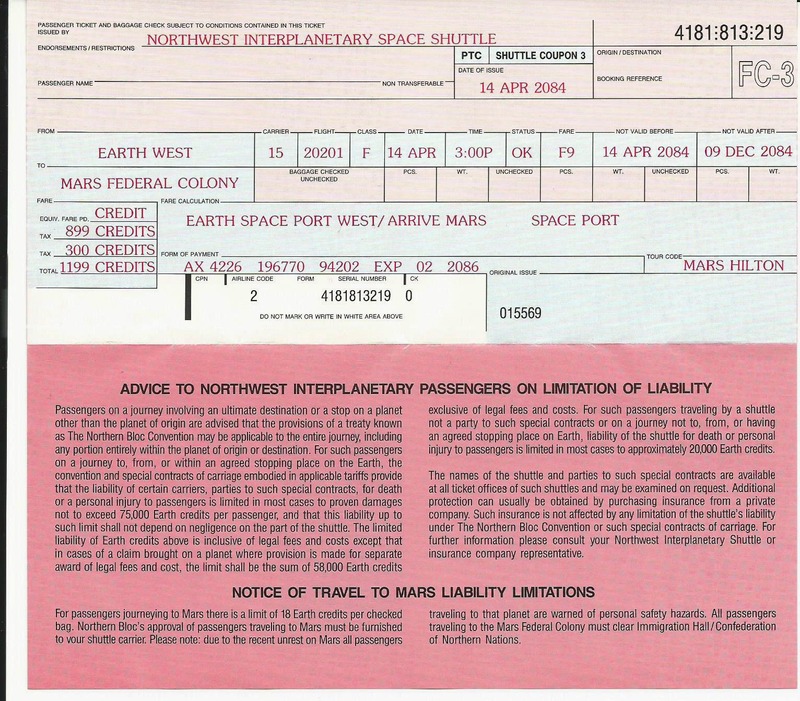 Maybe I can use it to take my wife to Mars for our 85th Wedding Anniversary. 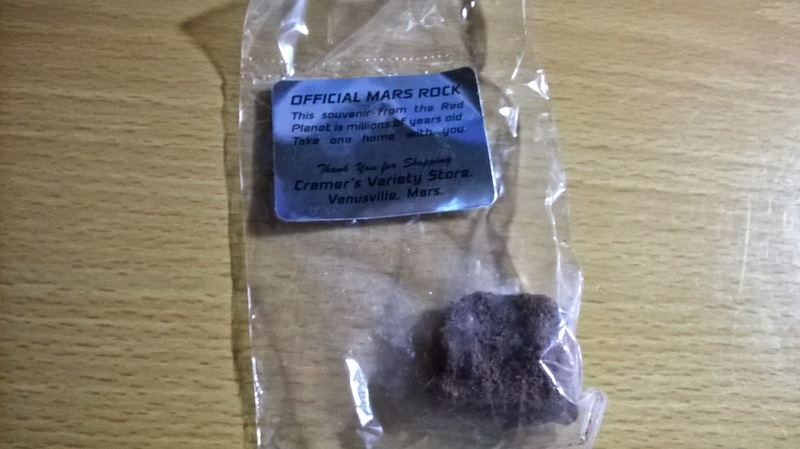 Mars Rock from Cramer’s Variety Store in Venusville, Mars. Not really a Martian rock, it appears to be a lava rock really, but still cool. There are meteors that have been found, the most recent in the Sahara in 2011, that is made up of Martian stone but I am betting Pacific found it cheaper to use lava rock instead of a real piece from a meteorite. 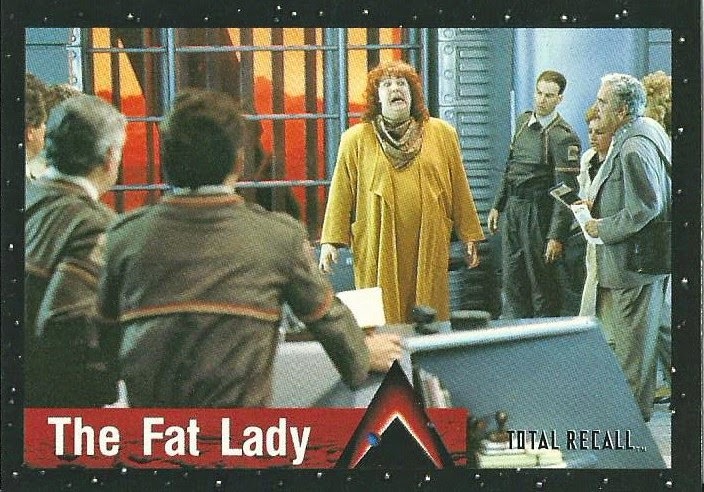 If you are like me you are probably wondering if every memorable scene was included in the card set? Sadly, No. Pacific went the P.C. route and did not insert a card depicting our favorite three-boobed prostitute Mary, played by actress Lycia Naff. 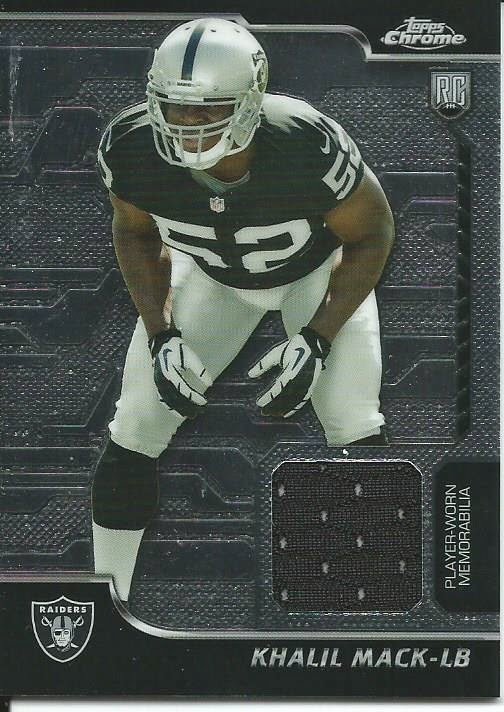 I felt it was my duty to rectify the situation so here you go, what would be considered card #50b on the checklist. Here is my What If? version of Mary's card. I recently read a 2012 interview with Lycia Naff, where she said she was embarrassed about the part and has felt shame ever since. She didn't realize that the part required her to open her shirt (she apparently was only told during the first take), she thought the three-boobed prosthetic was just going under her blouse and she was actually crying on set before the camera began rolling. Naff is very thankful that Kaitlyn Leeb, who played the three breasted Mary in the 2012 remake, has embraced the role taking the limelight off of Naff. 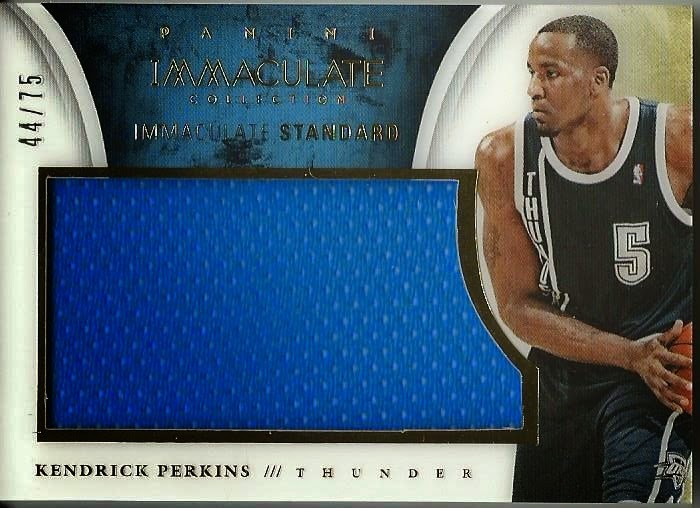 In September I was fortunate enough to win a box of 2013-14 Panini ImmaculateBasketball from contest on Panini’s blog. This was quite an amazing prize considering that boxes are still selling over $400 each months later. This is the highest priced product I have ever opened and is one of the high risk/high reward type products if you can pull some of the better cards, including the Sneak Peek show cards. 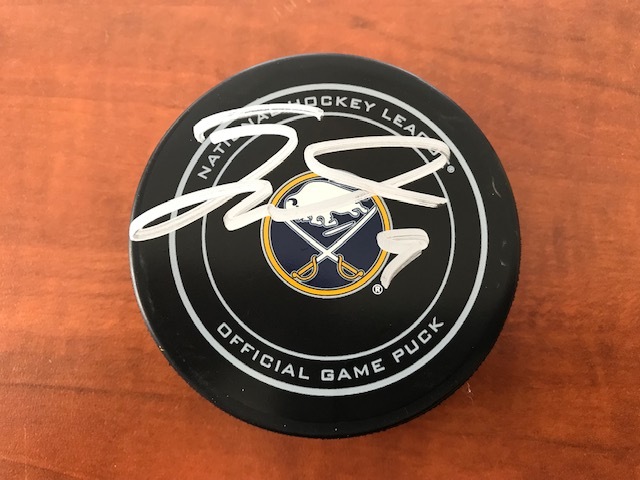 It was a unique experience opening the tin and I appreciate that Panini has connected to their collectors with their contests and given us the opportunity to win a product that we normally would never have opened otherwise. 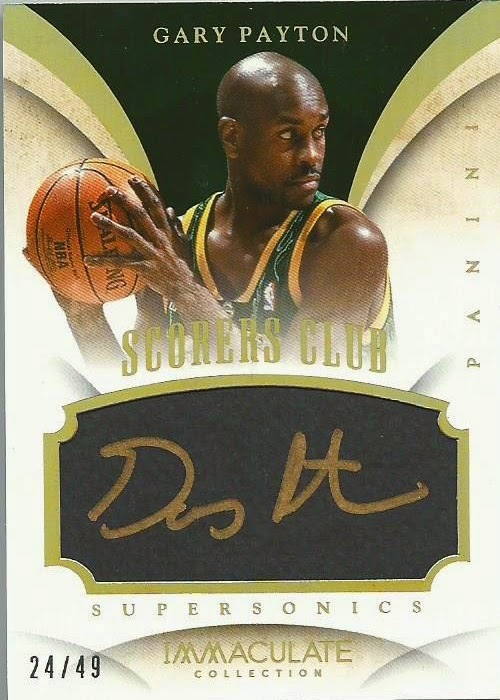 I kept the Gary Payton Scorers Club autograph #/49 and the Alex Len Rookie Patch auto because I collect Suns and Sonics. 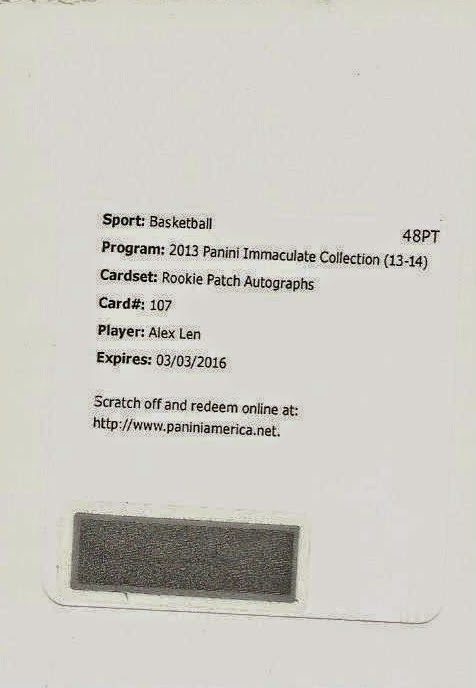 I redeemed the Len rookie patch on October 7th and it is still in the queue waiting to be filled. I probably should have held on to the cards a little bit longer because the closer we get to Christmas the higher the prices get. 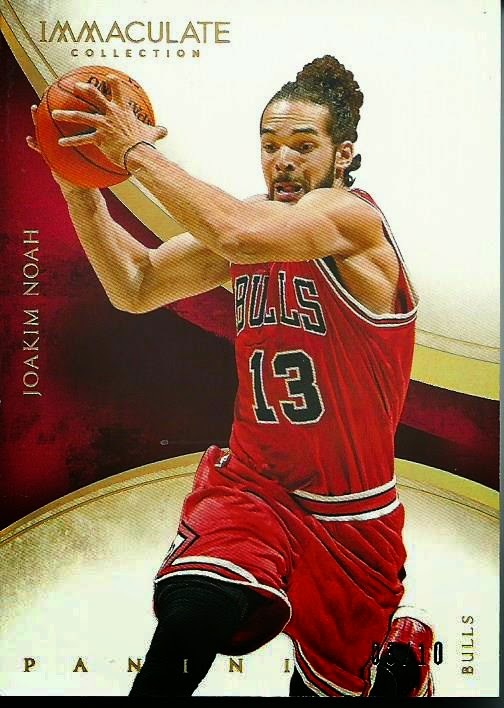 The Noah gold base was relisted 3 times without anyone biting, I eventually lowered the price by a dollar and finally sold it. 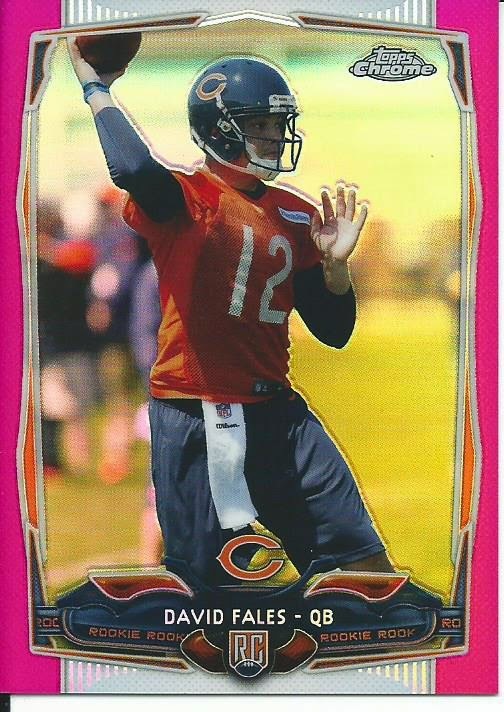 There is currently one gold base version #/10 at $14.00 BIN but I can almost guarantee it won’t sell at that price. The Perkins jumbo relic was also relisted 3 times without any interest, I lowered the starting to .99 cents and it sold the same day as the Noah base card. 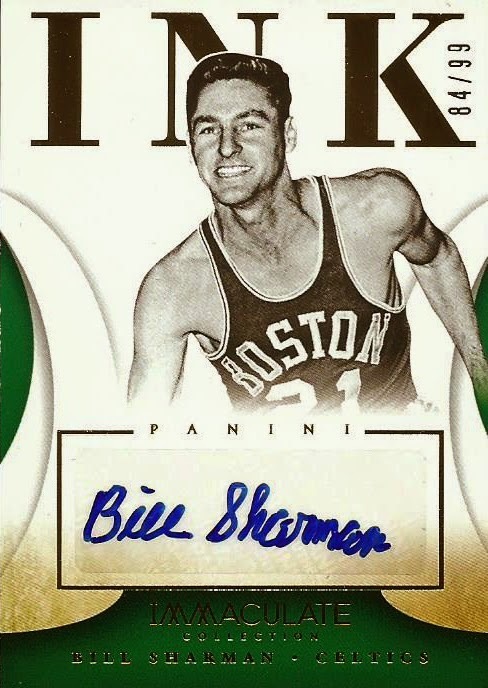 The Sharman Ink auto was the last card to sell, Dec 9th, and was the surprise sell of the collection. It actually sold during the first listing at a higher price than expected. When I was pricing his cards his autographs seemed pretty common and his base Ink autos (like mine) were selling in the $2-5 range with the gold parallel #/10 version selling in around $7-10 range. A couple of last day bids jumped it to over $15 and my jaw dropped. Not a huge sale but considering that it was more than double of what I expected this was a win. 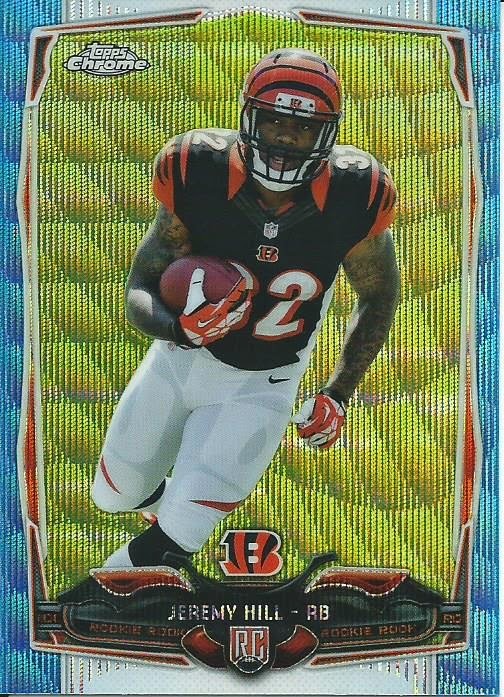 Plus there was chipping on the card front I didn’t even expect to top $2-3 sale price. 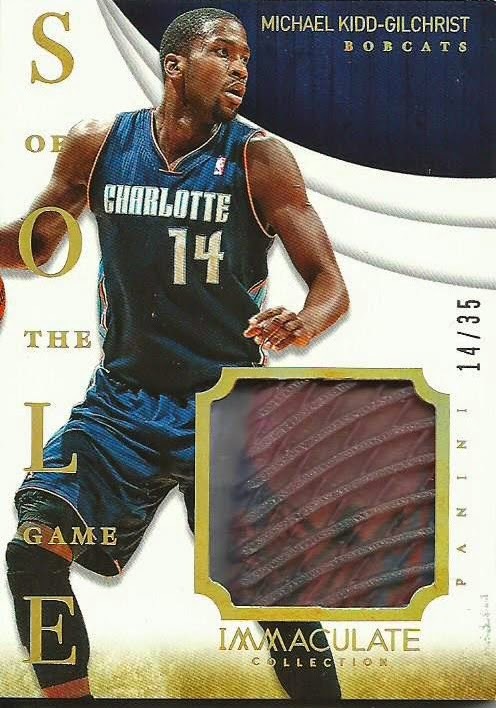 The final card on the list, which was actually the first to sell, is the Michael Kidd-Gilchrist Sole of the Game shoe relic. When I listed it there were two already for auction with $29.99 and $35 BIN prices so I came in at $19.99 opening price and a $29.99 BIN option but I had no interest. When I relisted it after 5 days I dropped the starting price to $9.99 with a $24.99 BIN option. I ended up topping the BIN price by almost two bucks so I am not too upset. In the end I was able to sell the four cards and make $49.05 plus shipping, which I have used to add some cool Griffey cards to my collection and one special card that has been on my Want List for 2 years (well, not the specific card but another version so I am happy). 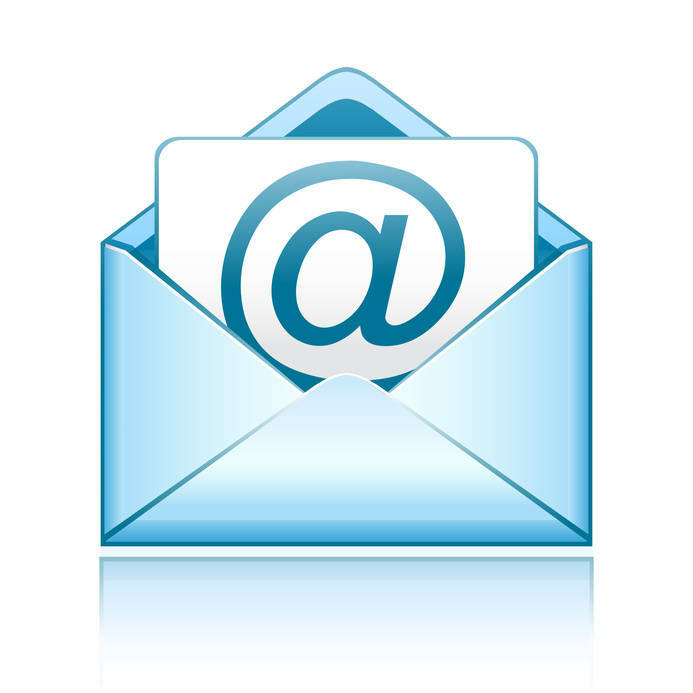 You will have to wait to see the "Want List" card on another day, it is being shipped right now and should be here by Thursday. For a blog named Pack War I have never had a pack war on my blog so I decided to rectify that today. 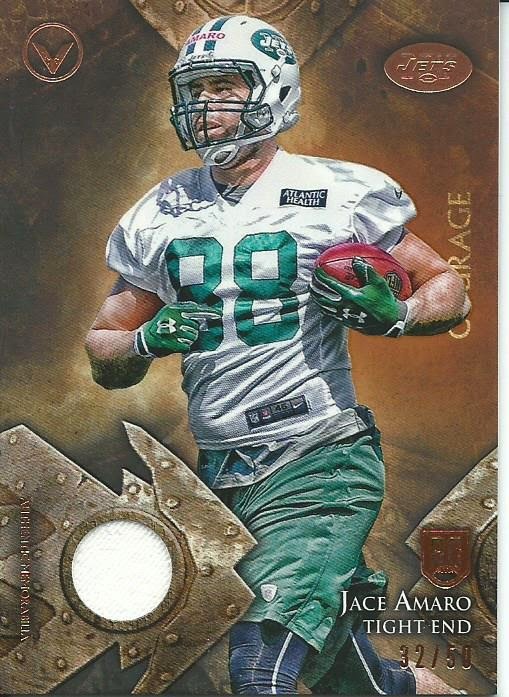 I picked up a Topps Chrome Football blaster and Topps Valor Football blaster, each box contains 7 packs and a relic. 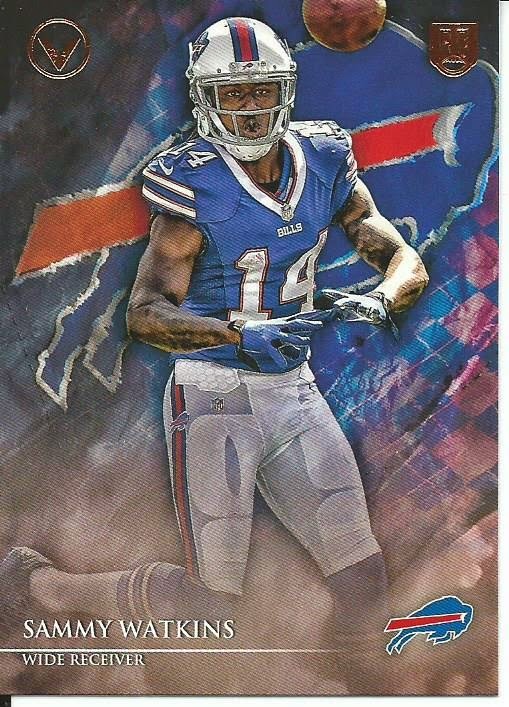 Valor packs have 8 cards where the Topps Chrome packs have 4 cards per pack, Chrome better bring it on strong in order to win. 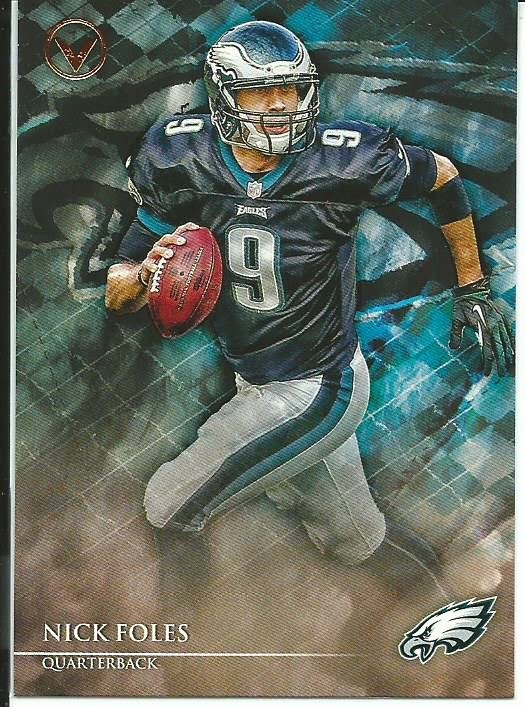 Valor did bring it with two Top 5 picks and former Arizona Wildcat Nick Foles but pulling a Blue Wave refractor of a rookie having a good season gave the edge to Chrome. 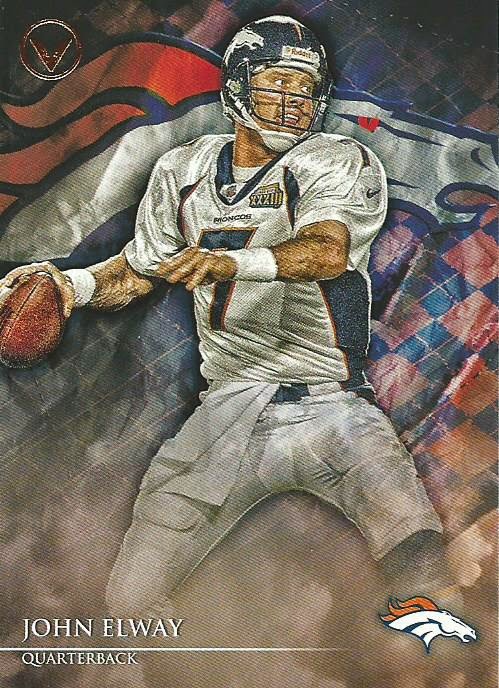 Valor had two HOF QBs and that alone is worthy of the win. It was an easy win too because while Chrome had a Pink and X-Fractor neither rookie has any playing time. 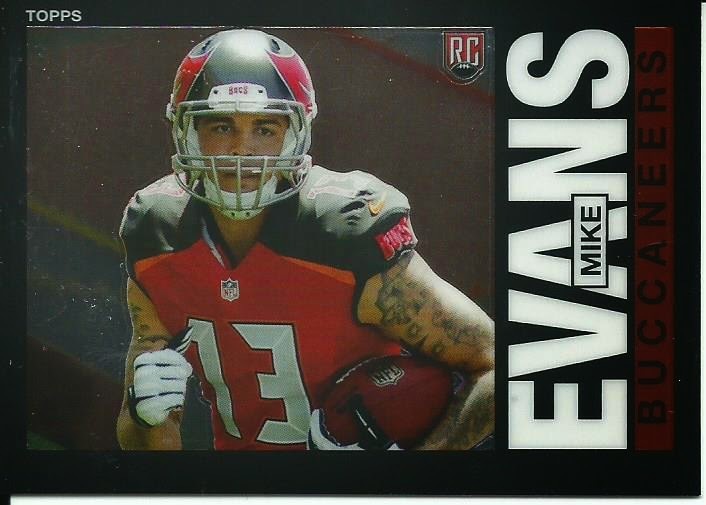 This one was a toughie because I pulled the very cool looking Mike Evans 1985 Topps insert from Chrome but Valor delivered my first Seahawk player, Chancellor, and first Cardinal player, Peterson. The edge goes to the teams I collect and Valor takes the win. 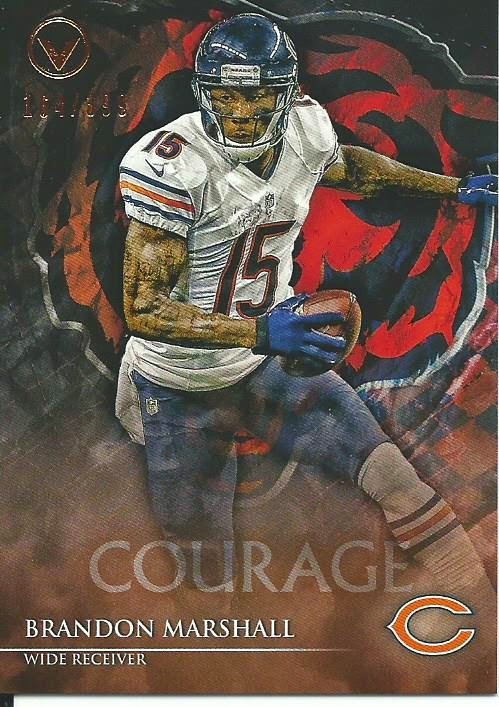 This was another toughie because Valor finally gave me a parallel with the Marshall Courage parallel plus a Cardinal player but Chrome included former Arizona Wildcat Nick Foles, the one-handed magician Odell Beckham Jr. and a neat Bridgewater mini. Another series that could have went either direction. 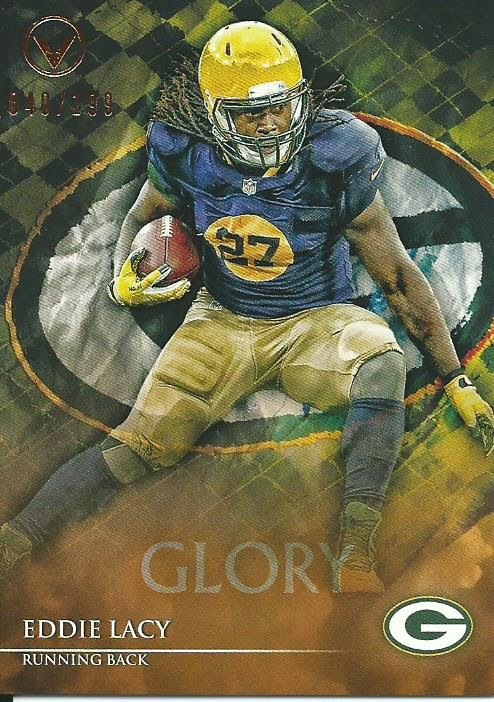 The Eddie Lacy Glory parallel really pulled me towards Valor but the former Wildcat Gronk and the Kelvin Benjamin RC swayed me to Chrome. 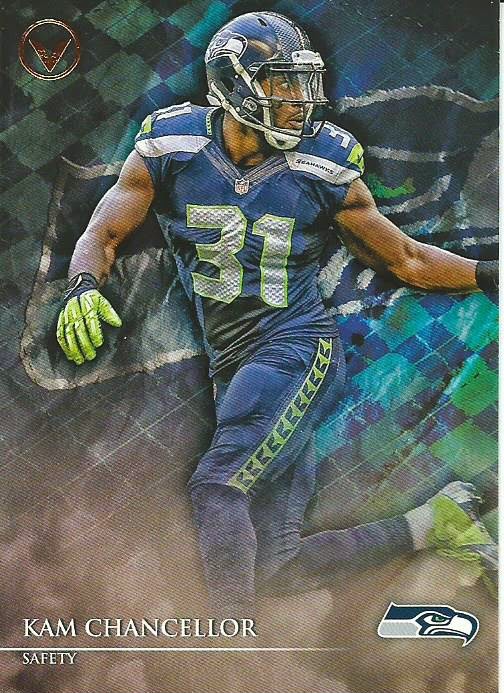 Had Harvin still been with the Seahawks Valor would have won in a slamdunk and taken the Pack War win but now it is down to the final pack. It went down to the final pack, which Valor won hands down. Chrome was at a slight disadvantage with only 4 cards per pack compared to Valor’s 8 cards per pack but Chrome really put on a show with a nice selection of “hits” with 7 refractors and 2 inserts while Valor only had 3 parallels inserted and no inserts. Is It Time To Use The Word "Bust"?